A Fruit a Month is a blog even which focusses on food featuring a new fruit each month. This month, Mansi of Fun and Food is hosting A Fruit a Month, and the fruit in focus is peaches or nectarines. My fruit of choice is the delightfully fuzzy peach. Unfortunately, peaches are not yet in season in Australia, so I have used canned peaches in juice and peach yoghurt (peach melba to be exact!). I have chosen to make muffins which are "peachy keen" because not only are they light and delicious, they are also low in fat. There is no oil or butter in them, with the fat content coming from low fat yoghurt and a single egg. Preheat oven to 200 degrees Celsius. Spray a 12 hole muffin tin lightly with cooking spray or oil. Sift flour, salt, baking powder and baking soda into a bowl, and stir in the sugar. In a separate bowl, whisk together the yoghurt, egg and essences. Pour into the dry ingredients and mix until just combined. Fold in the peaches and spoon into the muffin tin. Bake for 25 minutes or until cooked when a skewer is inserted. Remove from the oven and cool in the tin for 10 minutes before turning out to cool completely on a wire rack. Thanks to Mansi for hosting AFAM, and I look forward to the roundup! Postscript: You can find heaps of innovative peachy recipes in the roundup, which is here. The theme for this month's Garden Cook blogging event, hosted by Paulchen's Foodblog, is Cranberries. There are so many great recipes featuring cranberries that I had a hard time choosing which one to make this time around. 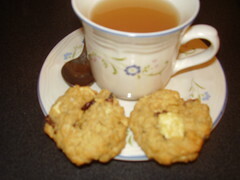 I settled on a recipe for White Chocolate and Cranberry Cookies by Bill Granger (of Bill's Restaurant, Sydney and some fun Macleans toothpaste ads here in Australia) published in The Sydney Morning Herald on 17 October 2006. Preheat oven to 180 degrees Celsius. Cream the butter and sugar, then add the egg and vanilla and beat until smooth. Fold in the sifted flour, baking powder and salt, then finally, add the chocolate, oats and cranberries and stir until combined. Roll teaspoonfuls of mixture into balls and place on greased and lined baking trays, then flatten with a fork. Bake for 15 minutes or until a pale gold. Cool on the trays for 5 minutes before transferring to a wire rack to cool completely. These cookies don't spread much during baking, so it is important to flatten them to the desired thickness before baking. Otherwise, these cookies were really easy to make, and would be delicious with a cup of tea or coffee for a morning or afternoon tea treat. Thanks to Paulchen for hosting this month's Garden Cook event! Postscript: The roundup can be found here. I have missed you terribly since you left Lock Willow. Although my head tells me that I should know better, thoughts of you continue to haunt me. I miss your voice, your piercing eyes, your stripey shirts, your cheeky grin and your quirky sense of humour. Lock Willow is nowhere near as fun now that you are gone. Mrs Semple allowed me to bake yesterday. Knowing that you like chocolate chippies, I decided to bake my own chocolate chip cookies, even though you are not here to enjoy them. The heavenly aroma from these biscuits enveloped the whole kitchen, and it was so tempting to eat two (or three!) myself. They were soft, sweet, chocolatey and ever so good, and everyone at Lock Willow enjoyed them. Sift flour and salt into a bowl and set aside. Mix the melted butter and sugars together, then beat in the egg and vanilla essence. 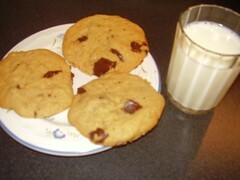 Fold through the flour and chocolate chips. Drop teaspoonfuls of mixture onto greased baking sheets, and bake for 15 minutes. Cool biscuits for 10 minutes on the trays before removing to a wire rack to cool completely. I hope you get a chance to try these biscuits some day Daddy - I am sure that you'd enjoy them. I love Moroccan food, with its rich spices, luscious fruit and flavoursome meat. One of my favourite restaurants is Souk in London, which serves delicious Moroccan food, and creates a great atmosphere with its cave-like interior, scatter cushions, belly dancers and even hookahs (the latter of which I rejected). 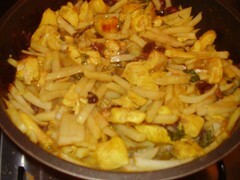 Last weekend, I tried out a new Moroccan recipe - tagine of chicken with potatoes and olives. I am unsure how authentic it is, but it is certainly good. It involves braising 600g of chicken, then adding 2 bay leaves, 2 grated onions, salt to taste, 1/2 teaspoon tumeric, and 1/2 teaspoon ground ginger and simmering on low heat for 30 minutes. Next, add 800g diced potatoes (skin on is fine), top up the water and continue to simmer until the potatoes are soft. Finally, during the last 5 minutes of cooking, add two sprigs of fresh thyme, a handful of torn fresh coriander leaves and 12 chopped black olives and season with pepper. If you like baking or eating pie, or love a good chick flick, then I highly recommend that you see Waitress. I drooled through a lot of this film (figuratively speaking! ), as the central character, Jenna (played by Keri Russell from Felicity), works in a pie diner and invents highly creative pie recipes with even more creative names, such as "Kick in the Pants Pie" (cinnamon custard) and "Marshmallow Mermaid Pie" (lots of marshmallows!). You can only cringe in horror every time that Jenna's husband, Earl, hits the screen, as his jealous, childish, violent nature traps Jenna in an unhappy marriage from which you pray she will somehow escape. Jenna's relationship with her obstetrician, Dr Pommeter, was also rather cringeworthy - however, it forms an important part of the plot, as Dr Pommeter gives Jenna some flashes of happiness and reason to hope. With all the luscious fruit, rich chocolate and smooth custard in this film, I was craving pie (or any other food!) for most of this film. The visuals and dialogue in this film are a treat, and I highly recommend it. I tried another recipe from the beautiful Chocolate & Zucchini recipe book by veteran food blogger, Clotilde Dusoulier, for the occasion of another colleague's (Luke's) birthday. I thought it only fitting that I tried the title recipe, Chocolate and Zucchini Cake (which can also be found here on Clotilde's blog). It sounded quite delicious, as it contains both cocoa and chocolate bits, and to my mind, the use of grated zucchini in a cake is intriguing rather than off-putting. As Clotilde promised in her introduction to this recipe, it produced a moist, deeply chocolatey cake. Personally, I liked it. However, I know that at least one of my colleagues, Julien, did not like this cake - he described it as "interesting", and when pressed, as "not his thing". Another colleague, Marian, described it as "OK". No-one raved about this cake, so to some extent, I take this as the barometer of how my baking is received. Don't let my experiences put you off trying this recipe - it does produce a moist chocolatey cake, and I am not sure why it was not as well received as some of the other chocolate cakes that I have made. I would be interested in hearing from anyone else who has made this cake what they thought of it. This week it was also Lee's birthday at work. Lee is trying to lose weight, so I thought that I would bake a low fat cake option for him so that I did not tempt him away from his weight loss program. My choice, coffee and ricotta sponge, was a little experimental. However, it was surprisingly well received. This cake consisted of two layers of coffee flavoured sponge, filled with low fat ricotta cheese flavoured with honey and brandy, and iced with coffee flavoured icing. Preheat oven to 180 degrees Celsius. Grease and line a 20cm round cake tin. Sift the flour and instant coffee together and set aside. Beat the eggs and sugar together until thick. Gently fold the flour mixture into the egg mixture, then pour the cake batter into the prepared cake tin. Bake the sponge cake for 30 minutes or unbtil cooked when tested with a skewer. Cool on a wire rack. Cut the cake into two equal layers. Mix the ricotta, honey and brandy together until smooth, then spread on the bottom cake lawyer and place the top cake layer on top. Mkae the icing by mixing together the icing sugar and coffee essence with enough water to make an incing of spreadable consistency. Spread 3/4 of the icing over the top of the cake. Mix the remaining icing with the cocoa powder to make mocha icing. Place the mocha icing in a piping bag and pipe a decorative pattern on top of the cake. Andrew of Spittoon Extra is hosting this month's Waiter There's Something in My ... blogging event, and has chosen the theme of layered cake. The requirement for participation is to blog about a multi-layered, baked cake. While sitting in one of my favourite cafes, Raydar, in Richmond, I was flipping through the December 2003 issue of Australian Gourmet Traveller when my eye was caught by a photograph of a beautiful multi-layered cake, labelled Zabaglione and Raspberry Torte. I scribbled down the recipe on a stray piece of paper from my handbag, and thought that it would be perfect for this month's Waiter event. This cake is rich but delicious. It is a definite "special occasion" cake, but is worth the effort required to make it. And I think you'll agree from the photographs that it is truly a beautiful cake! Combine egg yolks, sugar and vanilla in a heat-proof bowl and whisk until well combined. Whisk in marsala. Place bowl over a saucepan of simmering water and whisk mixture until thick. Remove bowl from heat and cool mixture. Beat cream until firm peaks form, then fold into custard mixture. Cool the custard to room temperature. Sift flours, almond meal and baking powder into a bowl. Beat butter and sugar until light and fluffy then add vanilla. Add egg yolks one at a time, stirring between additions. Stir in flours and milk alternately in two batches, and mix well. Whisk egg whites with sugar until thick and glossy. Fold half of egg whites into batter, then fold in the other half of the egg whites until just combined. Pour the batter into a greased, lined 22cm cake tin, and bake at 180 degrees Celsius for 25-30 minutes or until cake is cooked when tested with a skewer. Cool completely. Cut cake horizontally into 3 equal layers. Put base layer into the bottom of a lined springform pan. Spread half of the custard over the base, and top with half of the raspberries. Repeat cake, custard and raspberry layers once more, then top with the final cake layer. Cover the top of the springform pan with clingfilm, and refrigerate overnight. Serve dusted with icing sugar. This cake is absolutely delicious, consisting of a delicate almondy cake filled with smooth and creamy custard and fruit. I made it for an informal dinner party, and it was a hit. It is also the first time that I have attempted to create layers by cutting one cake into several layers rather than baking several separate cakes, and I was proud of my efforts. I read that the trick to even layers is to place the cake on a lazy susan, and rotate the cake while you first mark a groove around it for each layer with a serrated knife, then continue cutting into that groove deeper and deeper as you rotate the cake until the layers have been sliced through. It worked pretty well! However, note that the cake is quite delicate, so be careful with the layers once sliced. Thanks to Andrew of Spittoon Extra for hosting this month's Waiter There's Something in My ... event, and I look forward to the roundup! Postscript: The roundup is now available here. Read it and weep with joy! Stephanie of Dispensing Happiness is once again hosting Blog Party - this time with the theme of Halloween. Blog Party requires you to produce an appetizer and a drink which suit the theme, and blog about it - simple! I have chosen sweets for my appetizer, in the form of Bleeding Heart Patty Cakes decorated with spider webs. This is a really basic Halloween treat. Simply make your favourite cupcake recipe (or use a cake mix) in patty pans. Once cool, cut a cone out of the top of each cake (and reserve it), fill the hole with red jam (I used raspberry), then cut the point off the piece of cake you cut out and replace it like a lid over the jam. To decorate the patty cakes, I used Nigella Lawson's Halloween cupcake icing recipe from Feast, then piped a spiral on the top of each cake using white tube icing and drew a skewer through the spiral 8 times radiating from the centre to form a spider web on the top of each cake. The black icing looks pretty scary, and it dries very thick and very fast. However, it tastes delicious (although it is very sweet), and the hardest part will be convincing people to try the black coloured cakes in the first place. For my drink, I kept it black and basic - a classic rum and coke. Not inventive, perhaps, but it goes well with the Halloween theme. Cheers! Thanks to Stephanie for hosting Blog Party and suggesting the Halloween theme for this month. Postscript: The Halloween blog party round up is now available here. Because I love baking sweets so much, I try to keep the fat and calories down in my main meals so that I can fit in a few treats. A couple of years ago, the Brisbane Extra television program featured a series of low fat recipes by Annette Sym, author of the Symply Too Good to be True series of cookbooks. One of the featured recipes was Macaroni Beef, which I tried out for the first time this week. You can find the recipe for this Macaroni Beef here. It is quite easy to make once you get over grating the zucchini, carrot and cheese (I hate grating - too much elbow grease required and too high a danger of skinning yourself). It also contains only 7-8g of fat per serve, even with the cheese and white sauce topping (which you may leave off for an even lower fat meal). I served this dish with steamed vegetables, and found it both filling and delicious. It is definitely worth a try if you are after an easy, low fat but tasty meal. Zorra of Kochtopf is hosting The World Day of Bread on 16 October 2007 for the second year in a row. This blogging event simply requires participants to bake or buy bread and blog about it - it's that simple! My success to date baking with yeast has been limited - read "my bread didn't rise". Despite this, I decided to give it another chance and selected Chelsea buns as my bread of choice. A wonderful summary of the history of the Chelsea bun by Anna of Baking for Britain can be found here. I loved Chelsea buns as a child, with their soft, spicy, fruity centres and bright pink icing (although according to Anna, they should be coated with a honey glaze before baking rather than iced). As with many traditional favourites, there are a myriad of recipes for Chelsea buns. The recipe which I chose can be found here. The beauty of this recipe is that it didn't require the dough to proof overnight like some other bun recipes, and given my short timeframe, I couldn't devote 24 hours or so to making my buns. The only changes that I made to the recipe were to use 1 sachet of live dry yeast instead of compressed yeast, and to replace the suggested spices with one teaspoon of cinnamon and one teaspoon of cardamom. I used only sultanas for the fruit component of the buns, consistent with those buns which I remember from my childhood. To try and trick the yeast into rising, I placed the bread dough under my bedroom touch lamp, which generates quite a bit of heat. This seemed to do the trick, as my dough actually rose, making for a very happy Cakelaw :) I also chose to ice the buns in accordance with the recipe and the buns that I am used to, even if this is not strictly traditional for Chelsea buns. Thanks to Zorra for hosting the World Day of Bread, and I look forward to being inspired into baking bread more often by the roundup! Postscript: The roundup is now available here. Today is Charet's birthday, and to celebrate, Charet and her partner Marco hosted a wonderful lunch at their house. After a miserable day yesterday, today shone bright, sunny and warm. We dined al fresco in Charet and Marco's courtyard with Charet's two cats, Geordie and Morty, prowling hopefully around for a tidbit. We started with dumplings with soy, chilli and mustard sauces, followed by a hearty meal of fettucine with prawns, mussels and asparagus made by Marco. The piece de resistance was when Charet brought out the gorgeous birthday cake pictured, which Charet had baked herself. It was a rich, decadent chocolate mud cake, with fluffy, sweet meringue sandwiched in between the two layers, then smothered in chocolate ganache and topped with juicy blueberries. This cake was Charet's own invention, and I was very impressed! It was a wonderful, lazy afternoon, in which the sun shone and the wine and conversation flowed. A big thank you to Charet and Marco for hosting such a lovely afternoon. And happy birthday Charet! This month, Sugar High Friday is hosted by Andrew of Spittoon Extra, who has chosen the theme of drunken apples. Before you scratch your heads wondering what on earth this means, this requires you to make a dessert featuring apples and alcohol and blog about it. I have never previously made any dish that fits both the apple and alcohol criteria before, but I have for some time been eyeing up a delicious-sounding apple pie recipe from the latest food magazine that I have subscribed to, Dish. This gorgeous magazine is published in New Zealand, and joins the growing list of all things Kiwi with which I have become besotted: food magazines (Dish and Cuisine), Lisa Hoskin jewellery, the breathtaking scenery, music (Split Enz and the Finn brothers), fashion (Trelise Cooper and Karen Walker) and a Kiwi guy (he ought to know who he is ;)). The apple pie that I have made for SHF contains sundowner apples (although the recipe does not specify any particular apple variety, hence you can substitute your favourite) and brandy. The apples are sauted with butter before being combined with brandy and a delicious combination of dried fruits and nuts, then covered by a crisp pastry top. The final pie looks, smells and tastes absolutely devine, and is really quite simple to make. Blitz the flour, salt and icing sugar in a food processor to combine. Add the butter and blitz in the food processor until coarse crumbs form. Add the water gradually and blitz until a ball of dough forms. Chill the dough wrapped in cling film for one hour. Grease a 6 cup capacity pie dish and preheat the oven to 180 degrees Celsius. Toss the apples with the lemon juice and zest, brown sugar and spices in a bowl to coat. Melt the butter in a large frypan or saucepan, then cook the apple mixture in the butter until the apples just start to brown. Add the dried fruits and brandy to the pan, and cook until the apples are soft. Remove from the heat, add the toasted nuts and allow to cool completely. Roll out the pastry until it is 1cm wider than the pie dish. Cut a 1cm wide strip of pastry to line the edge of the pie dish. Place the fruit mixture into the pie dish. Brush the pastry strip with water and press around the edge of the pie dish, wet side facing the dish. Brush the pastry strip with egg wash. Drape the remainder of the pastry over the top of the fruit, and join to the pastry strip by crimping with a fork round the edges. Cut a small hole in the centre of the pie to allow the steam to escape while baking. Brush the pastry top with egg wash and sprinkle with white sugar. Bake the pie in the pre-heated oven for 40 minutes or until golden brown. Remove the pie from the oven and serve warm with ice cream, cream or custard. Enjoy!!! I took this pie to a friend's house for dessert, and we both loved it. The only thing that I would change about this recipe is that I would double the pastry recipe and make a shell for the pie in addition to the top, to make serving easier and the final presentation more attractive. However, the sheer volume of fruit in this pie, flavoured by lemon, spices and brandy, makes it an irresistable treat. Thanks to Andrew of Spittoon Extra for hosting this round of Sugar High Friday - I look forward to seeing the drunken apples roundup! Postscript: The roundup of SHF - Drunken apples can be found here. On Tuesday night, I went to Steve's place for a Dancing with the Stars night. For those who have never seen this TV show in some form, Dancing with the Stars involves non-dancing celebrities training hard with a professional dancer to do various ballroom dances live in front of a studio audience. Each couple is then given a score by the judging panel of four, and viewers can phone in votes for their favourite couple each week. The public vote and the judges' score each count for half of a couple's total score, and each week, the couple with the lowest score is eliminated from the competition. This then continues until there are only two couples left in the competition to dance off for the winner in the final. I love the music, the glittering costumes, the banter from one of the hosts, Sonia Kruger, and the caustic remarks from the judges. For our Dancing with the Stars evening, Steve and I had a mouth-watering barbecue chicken pizza from Crust, one of the best pizza places in Melbourne. To follow up, I had brought along an orange yoghurt cake for dessert, which I served with Greek yoghurt. This cake is made from the same recipe as the lemon, blueberry and yoghurt cake that I made previously, but I left out the blueberries and substituted the lemon juice and zest for orange juice and zest. I found the resulting cake was a little drier without the blueberries, but it was still very pleasant, and the smell while it was baking was devine! Even better, this cake is low fat, so it is a virtually guilt-free dessert option. ECupcake has come up with a terrific food blogging event called Think Pink for Pinktober to coincide with Pink Ribbon Day in Australia on 22 October, which is designed to raise awareness of breast cancer. The requirement to participate in this event is to make a dish which is pink or contains a pink ingredient, and blog about it. I have not been personally touched by breast cancer. However, there are many women in the public eye who have been affected by this disease, such as Jane McGrath, Kim Walters and Kylie Minogue. Their tireless efforts to raise awareness of this disease and its effects on them and their loved ones has impressed on me the importance of early detection and how devastating this disease can be. I have chosen to make a Bejewelled Rhubarb Cinnamon Cake. This cake contains two pink ingredients - rhubarb and pomegranate seeds. I was inspired to replace the usual cinnamon and sugar topping on rhubarb cinnamon cake with pomegranate seeds by Nigella Lawson's gorgeous jewelled pomegranate cake from Feast. Preheat oven to 160 degrees Celsius. Grease and line a 20cm springform pan. Cream butter, sugar and vanilla with an electric mixer. Beat in sour cream and milk, followed by eggs, one at a time. Stir in sifted flour, bicarbonate of soda, cinnamon, sugar and rhubarb. Pour into prepared cake tin, and sprinkle the top with pomegranate seeds. Bake in the oven for 1 hour and 15 minutes, or until cooked through when tested with a skewer. Remove from the oven and cool in the tin for 15 minutes before turning onto a wire rack. Serve with cream, icecream, Greek yoghurt or custard, or by itself. Delicious!! Today, Patsy from work celebrated her birthday. Patsy is "top bird" in Australian parlance - she is a hard worker, easy to chat to and enjoys a drink and a laugh. Patsy's request when pressed for a birthday cake preference was for a baked cheesecake. This stems from an amusing but strange incident back when I made the baked lemon cheesecake. Patsy was away on the afternoon on which the lemon cheesecake was served, so I promised to save her a piece. Someone else made a strawberry refrigerator cheesecake that day, so we duly saved Patsy a slice of each and placed them on a plate wrapped in Gladwrap (cling film) and labelled "Patsy" with a post-it note. Because there were many distractions that afternoon, there was still a fair amount of both cheesecakes left over, so we gave away pieces to people on other floors. Despite this, when I came to work the next working day, the slice of baked cheesecake that I had carefully saved for Patsy had mysteriously disappeared! Given my promise to save her a piece of cheesecake, Patsy politely asked if I had remembered, and I told her the story of the disappearing cheesecake. We both had a laugh about it at the time - I actually found it quite flattering that someone had bothered to "nick" it. However, when I asked Patsy about her birthday cake preference, she was unequivocal in her request for cheesecake, as she had missed out last time. Grease a 20cm springform pan and preheat oven to 180 degrees Celsius. Combine the melted butter and crushed biscuits, and press onto the base and up the sides of the springform pan. (Tip - use a glass to help you push the crumb mix up the sides of the pan. However, don't ask me how to make it even!) Chill the base in the fridge while preparing the filling. Beat the cubed cream cheese with an electric mixer until smooth. Add the zest and sugar and beat well. Beat in eggs, one at a time, followed by sour cream and juice. Pour into the biscuit base, place in the oven and bake for 50 minutes. Don't worry if the top cracks - this will be covered with the topping. Take cheesecake out of the oven and cool while preparing the topping. Combine the topping ingredients and spread over the top of the cheesecake. Bake the cheesecake for a further 10 minutes, then switch off the oven and allow the cheesecake to cool in the oven with the door ajar. Once cool, place the cheesecake in the fridge overnight to chill. This cheesecake is smooth and velvety. Because it is fairly rich, you only need a small piece to be satisfied. I also think it is a very "grown up" cheesecake, because of its sophisticated appearance and taste. I liked this recipe because the end result was not overly heavy, as is the tendency with baked cheesecakes that you find in coffee shops. Judging from the fact that every last piece of this cheesecake disappeared, I believe it was a success. Most importantly, Patsy enjoyed it and saved a piece for her husband. Happy birthday Patsy! I enjoy trying different recipes for dinner so that I don't fall back into the chicken 'n' vege stir fry rut that I was in a couple of years ago. One of my favourite meats is chicken, and is the meat that I cook with most often. When I read about Clotilde's birthday chicken, I knew I had to try it. I like the idea of meat and fruit together in the one dish - it seems quite exotic for a girl brought up on meat and three veg (or in my case, meat and potatoes, because I wouldn't eat veges!). I loosely followed Clotilde's recipe for my version of the dish. By this, I mean that (a) I didn't marinade the chicken overnight because I didn't realise that I was supposed to until it was too late; (b) I left out the garlic because I forgot to buy it; (c) I used balsamic vinegar because I couldn't find sherry vinegar; (d) I used rose wine instead of white wine because that was what I had in the fridge; (e) I added coriander (cilantro) out of the tube to the dish before baking instead of sprinking fresh coriander on top afterwards; and (f) I forgot to toast the almonds before sprinkling on top! Despite all of these variations, both accidental and by design, this dish tasted great! I served it with boiled rice and steamed vegetables, and it is a definite keeper. I loved the sweetness of the prunes with the chicken and the sauce was devine. Who knows, I might actually make it properly next time! While I was working at a University as a legal officer, one of our secretaries was a lovely Kiwi girl called Danielle. Unfortunately for us, Danielle only worked with us for about 4 months before finding a new secretarial position at a school, which was more suitable for her because it was closer to her home and, as she was studying to be a teacher, was good experience for her future. I have to thank Danielle for introducing me to the beautiful jewellery by Lisa Hoskin, a New Zealand designer. I am now the proud owner of a Lisa Hoskin earring and necklace set which I bought on Trade Me, the Kiwi version of eBay. Except for Danielle wearing her beautiful Lisa Hoskin necklace to work, I would never have discovered Lisa Hoskin's jewellery, as it is not sold in Australia. I am going on holidays to New Zealand in a few months' time, and hope to pick up at least one more Lisa Hoskin piece at that time. I also have to thank Danielle for providing me with one of my favourite cake recipes. One day, Danielle brought in a slice of the loveliest cake for morning tea, which her mother had thrown together from bits and pieces that she had in the pantry. At my request, Danielle provided me with the recipe for her mother's cake, a date and orange loaf. This cake is sweet and fragrant, with the sweetness of the dates and orange juice offset by the sharp tang of orange zest. It is also the easiest cake in the world to make, as everything is mixed together at once in one bowl - there is no beating required. I have made this cake often since I first obtained the recipe, and I usually make it in a 12 cup muffin tin instead of a loaf tin so that I have individual serves that I can take to work each day. Mix all ingredients together in a large bowl until just combined. Pour into a loaf tin and bake in an oven pre-heated to 180 degrees Celsius. Cool for 5 minutes in the tin before turning onto a wire rack to cool completely. Enjoy! And Danielle, if you are reading this - thanks for this great recipe! On Friday, we lost the lovely Kasey from our ranks at work. Kasey is funny and patient and kind, and we will all miss her heaps. For Kasey's send-off, I made cherry cheesecake. It is a refrigerator cheesecake, set with gelatine. This is very sweet, so it's a once-in-a-while treat, but I love the cherry top, because it looks impressive yet is relatively simple to do once you know how. For the first time, I made this cheesecake using a chocolate biscuit base. I found this to be a little overwhelming, as it made the cheesecake even richer than usual, but this is a matter of personal preference. Combine the crushed biscuits with the melted margarine, and press into a greased 20cm springform pan lined with aluminium foil. Chill until firm. Cube cream cheese, and beat together with the condensed milk until smooth. Add the gelatine/lemon mixture and beat until smooth. Pour onto the chilled biscuit base, and chill until firm. Arrange the halved cherries over the top of the chilled cheesecake. Combine the reserved cherry syrup in a saucepan with the cornflour paste, and stir over medium heat until the syrup thickens and boils. Simmer for approximately 1 minute, then pour over the top of the cheesecake to cover the top completely. Chill until set. In addition to the cherry cheesecake, I made the chocolate date cake again at the request of Kasey's boss. 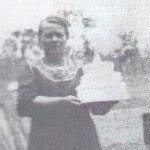 Below is a photo of that cake without the date icing. The consensus of opinion seemed to be that the cheesecake was delicious, although rich. It also did not firm up as much as I would have liked. (I wonder if the fact that I used light cream cheese and light condensed milk influenced this.) Unfortunately, Kasey did not get to try it because of the excitement of the moment, and leaving presentations seem to be held very late in the day. Oh well!